Got a K75S; Thanks for the Info! I haven't posted outside the New Member page, but I've sure read a lot on the forum. That's why I wanted to post a Thank You. The info I've gained from reading posts on this forum really helped me in my search and buying process. 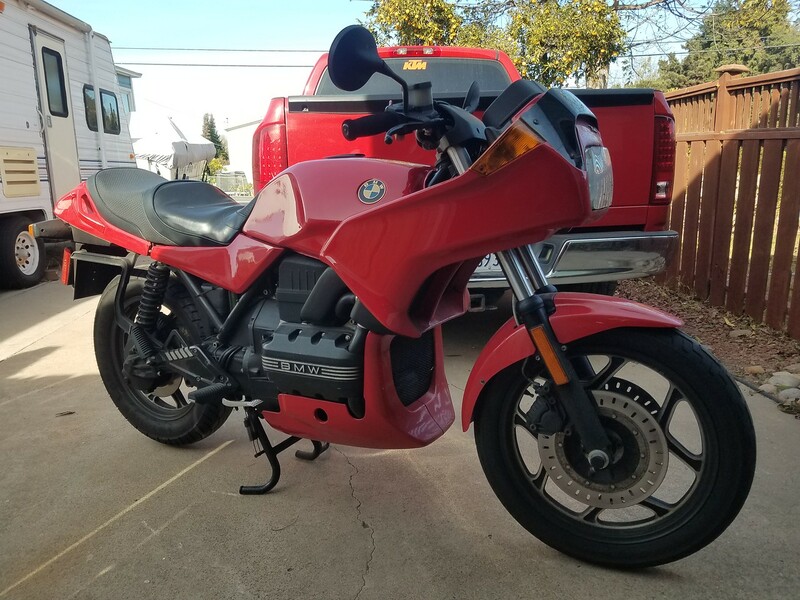 I'm returning to motorcycles after being out for...a while, and never did have a BMW. You guys got me caught up on the motorcycle/BMW world relatively quick and easy. Re: Got a K75S; Thanks for the Info! Congrats & welcome You've got the greatest 3 banger ever made! And the pick of the litter. Pics of the S or it didn't happen! I tried posting pics today in the Intro section. It was a battle I lost. I think it drew blood. I'm trying to come up with a name for it. Suggestions I've gotten from friends include Frau Buchler (Young Frankenstein), but I haven't seen that movie in years. That did cause me think of Lili, for Lili von Stuppe (Madelin Kahn in Blazing Saddles). That's the front runner for now. Maybe I should do something using the letters BMW, like Barry's Midlife Weakness. So many important things to think about. Yeah, I tried using the Motobrick gallery for a while but also struggled. What I do now is upload my pictures to Tinypic.com. The interface is straightforward and you can paste the resulting IMG string provided by tinypic directly in the Motobrick editor. What happened to the way photos are posted? You guys have me nervous about what I'm going to be up against when I post the updates on the Resurrection of Moby Brick thread later this week. I have always just posted from the photos folder on my laptop as attachments. That still works, doesn't it? Gryph I can see the Moby pics but the first one is in OZ format. Well I got one uploaded as my avatar. I thought that J O made the gallery to store photos that would get linked to posts. I tried using the Motobrick MyGallery for several posts I made, but surprisingly the photos would disappear from the threads. I could edit the contents and see the URLs for the photos, and verify that the URLs matched the Gallery photos exactly. But, they still wouldn't show up in the posts. I used to use Picasa but Google killed that product. So, I started to use Tinypic. It's free and easy to use. And it works for me. I'm not sure if you will encounter the same problems I did Gryph. Try and see. You should still be able to upload photos to the Gallery from your PC local disk, then grab the URL that points to the photo in the Gallery and paste it into an IMG tag. Just follow j o's instrux and be certain that the photos uploaded are under 350kb. I haven't had any problems yet, even when I'm touched by lysdexia. I'll admit though, resisting the name Tinypic could be difficult. I am guessing that most of you guys are posting from phones. I am still using s 1st gen flip phone and posting from a laptop. All I have to do is click on the attachments, click again on browse to open my photos file. Double click the desired image. Done. Easy peasy, no screwing around with urls or hosting services. My camera takes photos with large jpg files. When I take photos for the forum, I just make sure the desired image is a small portion of the frame, then I crop down to eliminate about 80% of the original image. Much easier than trying to use a resizing program. I used to use Picresize to shrink my pictures but it was slow. When for a time I couldn't access Picresize, Inge suggested Windows Paint. We had just had an upgrade and Windows no longer had paint but had paint 3D. With a bit of exploration I found that by clicking on the canvas icon which looks like a box with extended corners, that I could change the 100% to 50%. After changing I just save under the desired name, very quick and easy. The kids "draw" on Windows Paint often. I never gave any thought to it being able to be used with pictures. Use a hosting service like SmugMug. They are excellent and offer picture editing capabilities as well. You can use the service free or pay for upgraded features. It's very easy to use, way better than Photobucket ever was and the web interface is very nice. I've been using it since Photobucket pulled their ridiculous stunt and have been very happy with it. And to show that I'm not just pushing the service (I do pay for it), here's a pic of the borrowed 1989 K75s that I am currently riding while I'm having the forks from my 1290 Super Duke rebuilt by GP Suspension. I've since added a windscreen that I got from Motoworks in the UK as a thank you to the owner for letting me borrow the bike for a few weeks. As you can see, he butchered the original stock screen.